In Book 14 of Ovid’s Metamorphoses, Aeneas is at last making his way up the coast of Italy towards his destiny, leading to the foundation of the city and empire of Rome. Having cleared the dangers of Scylla and Charybdis, and seen the Cercopes who had been transformed into apes, Aeneas and his crew pass the city of Naples, and land at Cumae to visit the Sibyl there in her cave. 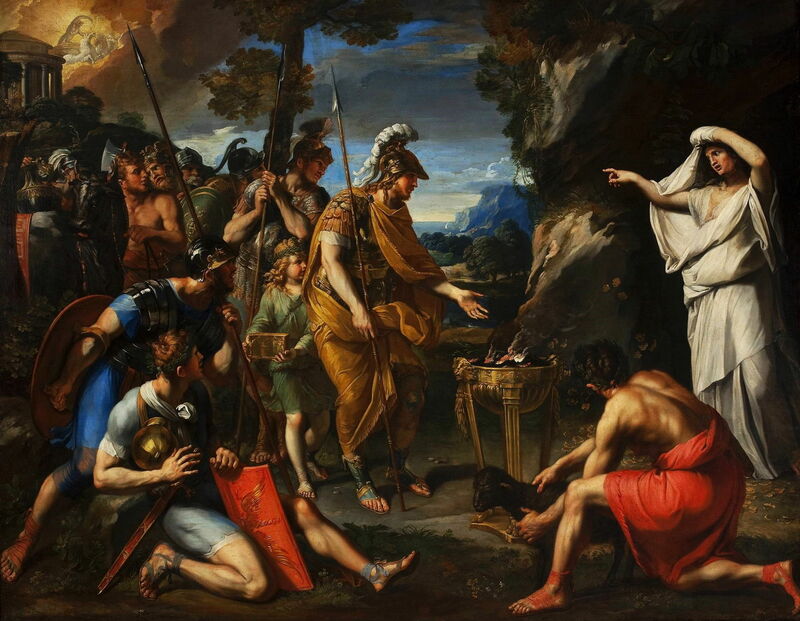 Aeneas needs to do this in order to go to the underworld to speak to the ghost of his father Anchises. The Sibyl reassures Aeneas that he will achieve his goals, and to that end she takes him to Proserpine’s sacred glade. Finding a golden bough there, she tells Aeneas to break that from the tree. Bearing that bough, the two of them travel to the underworld, make contact with the ghost of Anchises, and return safely. “For I forgot to wish them days of changeless youth. infirm old age, which I shall long endure. three hundred harvests, three hundred vintages! I once was loved and even pleased a god. or will deny he ever bore me love. 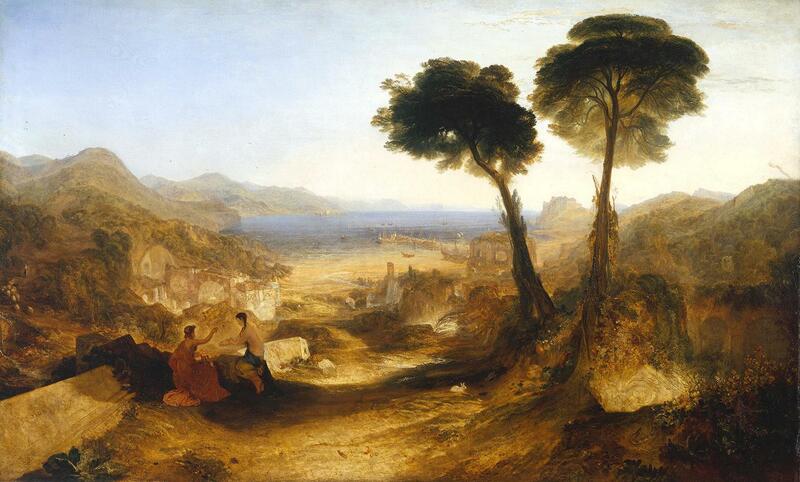 Aeneas and the Sibyl then reach Cumae, and he moves on to his next adventure. The two interlinked stories of Apollo and the Sibyl of Cumae, and Aeneas and the Sibyl, have both attracted the attention of several Masters. Indeed one, JMW Turner, cut his mythological teeth on them, and during the rest of his career painted at least three more works showing the Sibyl. 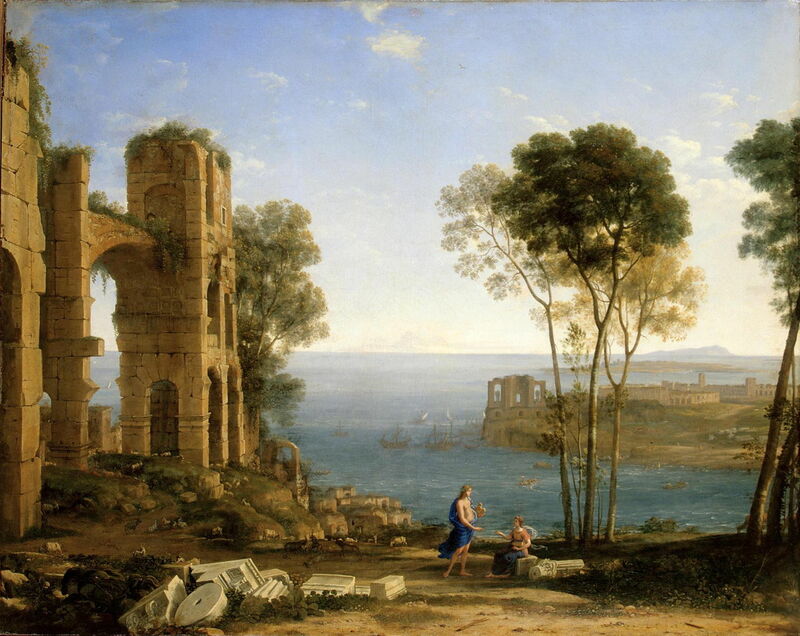 I start with one of Claude Lorrain’s most wonderful coastal landscapes, his Coast View with Apollo and the Cumaean Sibyl from about 1645-49. Although their figures are small, Apollo on the left is holding his lyre in his left arm, trying to persuade the seated Sibyl, to the right, to let him take her virginity. 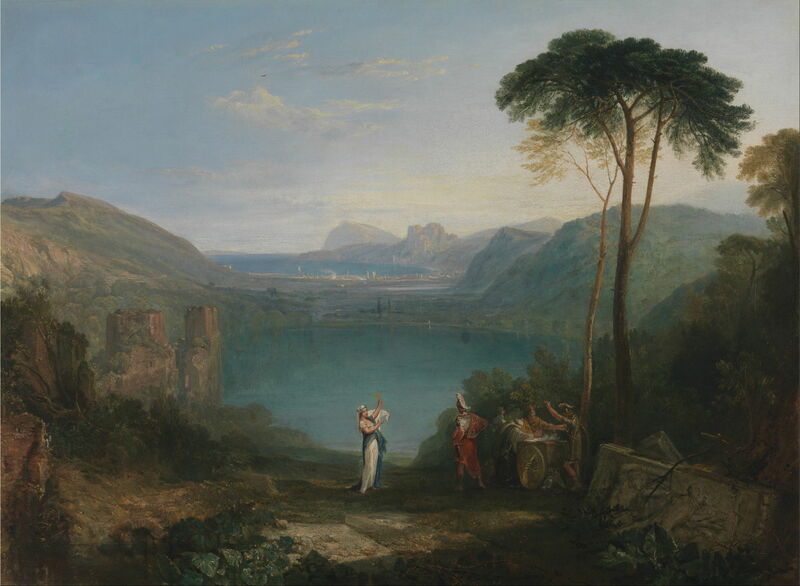 Around them are the ruins of classical buildings and a stand of tall trees, as the land drops away to an idealised view of the coast of Italy. I suspect that the island on the horizon is based on Capri. In the small bay immediately below them are some ships, which may be a reference to Aeneas’ future visit to the Sibyl, although that would have been centuries later according to the Sibyl’s account of her age. JMW Turner didn’t tackle this first part of the story until 1823, when he painted The Bay of Baiae, with Apollo and the Sibyl. His view appears to have been loosely based on Claude’s, with common elements, but has been recast at Baiae, in the Bay of Naples. Apollo is again on the left, with his lyre, but the dark-haired Sibyl has adopted an odd kneeling position. She is holding some sand in the palm of her right hand, asking Apollo to grant her as many years of life as there are grains. Opposite the couple, on the other side of the path, under the trees, is a white rabbit. Behind Aeneas is a queue of people, including a king, bearing gifts and waiting to consult with the Sibyl. At the top left corner is a temple, and in the clouds above it the god Apollo, I believe. 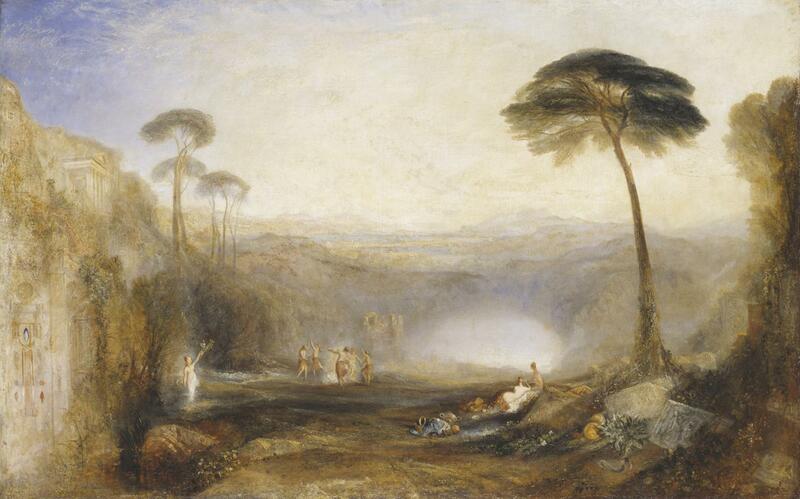 JMW Turner’s first version of this scene is thought to have been his first mythological painting, back in his early career, in about 1798. This second version, Lake Avernus: Aeneas and the Cumaean Sybil, dates from 1814 or 1815, and is both an improvement on the original and in better condition. Of the straight paintings of the Sibyl, hardly any show her as the seven hundred year-old woman of Ovid’s (and Virgil’s) accounts. 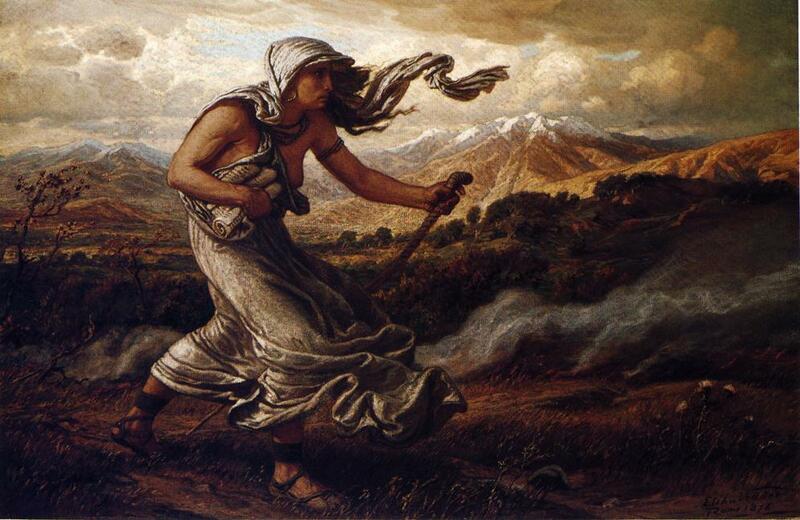 The painting which comes closest is probably Elihu Vedder’s The Cumean Sibyl of 1876. However, rather than show the Sibyl in the context of Aeneas’ story, he prefers to depict her in her other main role, going to sell the Sibylline books of prophecies to the last king of Rome. She strides out clutching these scrolls under her arm. There are also many fine paintings of Aeneas and the Sibyl visiting the underworld, which I will examine on another occasion. Posted in General, Language, Life, Painting and tagged Claude, Metamorphoses, myth, narrative, Ovid, painting, Perrier, Turner. Bookmark the permalink.